Kent Valley Ice Centre, Kent, WA., Thursday, August 2, 2018 - Kent Valley’s Learn to Play Hockey program is officially open for registration and the starting date has been set for the first session scheduled for Sunday, September 23rd. Please pass the word to your friends, neighbors and anyone else you know that has a girl or boy aged 4 to 10 and help us build our beginner program. Learn to Play Hockey (LTP) is offered in three flavors, Fall (24 sessions running September thru March), Winter (12 sessions running January thru March) and Spring (8 sessions running April thru May). Sessions may include breaks for holidays. Click here for full details and access to an LTP registration form. Kent Valley Ice Centre will be closed a few days to re-paint, re-line and groom the ice surface in preparation for the 2018-2019 hockey season. The ice rink will be closed starting Labor Day September 2nd and will be back up and running on Thursday September 6th. This effort along with other interior/exterior maintenance efforts this summer serve to make the Ice Centre more comfortable and enjoyable for our valued customers. The shooting station at Kent Valley’s Fitness & Training Centre is nearing completion. The final sections of glass are in place, the netting is being installed and the fire sprinkler heads have been protected from flying pucks. Soon, aspiring hockey players will be able to reserve the station in 15 and 30-minute increments when not reserved for team use. Get in Shape - Figure skating and hockey take more than just skill on the ice. You need to be strong, fast, and healthy to make sure you go home with the top prize. At Kent Valley Ice Centre, we ensure you have the tools and equipment you need to build your strength, improve your flexibility, and increase your stamina. Our Kent, Washington, Fitness & Training Centre is conveniently located inside our facility, so you can go from the ice to the gym without having to pack up. 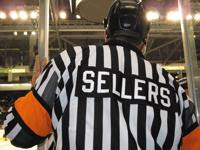 The Puget Sound Hockey Officials Association will host a Seminar for Referee Levels 1, 2 and 3 at the Kent Valley Ice Centre on Saturday September 22nd. The Clinic will start at 8:30am and run until 2:30pm. The USA Hockey web site indicates a Level 1 Registration requirement. On-Ice training is involved. Click here to register. The link will take you to the USA Hockey web site, Officiating tab and Seminar Registration page. Please feel free to contact pshoa.admin@gmail.com if you have any questions or desire further information. The Kent Valley Ice Centre is currently advertising for positions in the On the Edge Café, front office and facility maintenance. Customer friendly applicants should contact Les Grauer at (253) 850-2400 ext. 103. Kent Valley Ice Centre is a family-oriented recreation venue serving families in Kent and the surrounding communities. We feature an NHL regulation ice arena, batting cages, miniature golf and a Café/Sports Bar. We are seeking individuals to join our team and to assist with serving our customers quality food and beverages, and to assist with facility cleaning and maintenance. Opportunities for advancement are available. Individuals will work under the direction of Facility Management but must be self-driven and capable of solving problems and keeping busy when managers are unavailable.